Parotta salna is a famous street food in Tamil nadu, espeically in my native town Madurai. Though i have never tasted the salna in road side shops, i used to admire the sound of Kothu parotta and the mesmerizing smell of the salna made in the shops. Most of the salnas are non veg and so i never attempted to try that there. I remember tasting Chilli parotta from a famous road side shop in Madurai, which our friend bought once for us. Recently i got the recipe of vegetarian salna from our neighbor aunty, who gave me the recipe of kuska, kurunai vadai.. Aunty sent me the handwritten recipe through what's app and i tried it immediately the next day. It tasted so yum and we had with Kuska biryani and kids had with store bought frozen parotta. This parotta salna goes well with chapathi too. Grind the tomato,garlic,ginger,cinnamon,cloves,fennel seeds into a fine paste. Slice the onions lengthwise and finely chop the mint and coriander leaves. In a pressure cooker add oil and add the sliced onion and the chopped coriander and mint leaves. Add the ground tomato mixture, red chili powder and salt to the pressure cooker and saute till the raw smell of the masalas goes off. Add the veggies to this now and add 1 cup of water. Pressure cook this till 2-3 whistles. Open the cooker and add the coconut cashew mixture. Add little more water and bring it to one boil. 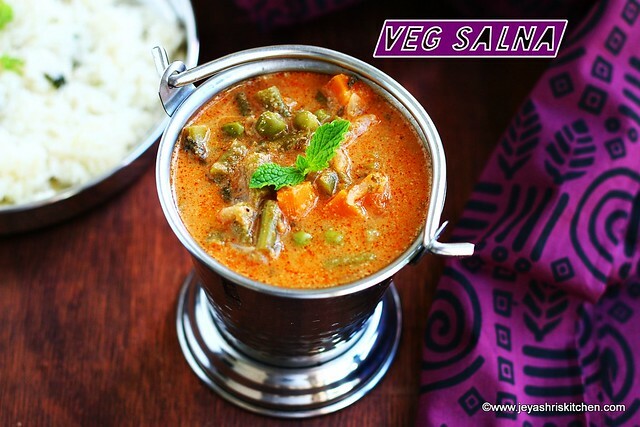 Salna will be little thinner than Veg kurma. Add the ground tomato mixture and mix well. Add the red chili powder and salt to the pressure cooker and saute till the raw smell of the masalas goes off. You can make the same without adding any veggies too. If you are not using any veggies, add 1 more tomato while grinding or add with the onions. 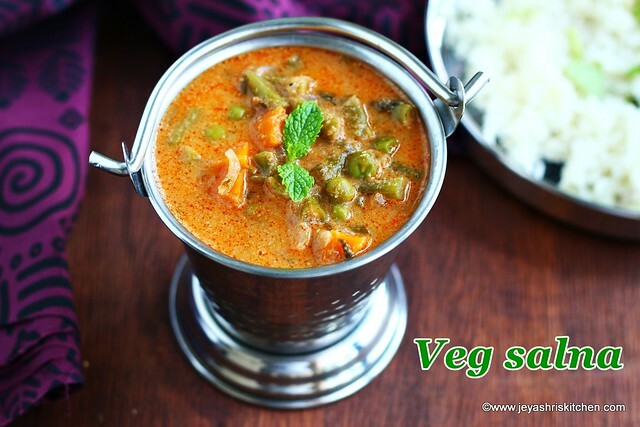 Veg salna goes well with parotta, kuska biryani,idli, dosa, idiyappam and Kothu parotta.